I love playing along with the Viva La Verve sketch challenge blog. My eye went right to the flower on the canvas wall art, it reminded me of a Hero Arts stamp that I have...so that's what I went with. First I embossed the image with white detail embossing powder onto white cardstock. Then I colored it with my Copics. I have no idea where I got this, but it sure does come in handy! Thanks for stopping by. I hope you are enjoying your weekend! Love the color combinations!!! Will make a great scrapbook layout, too!!! Gorgeous! 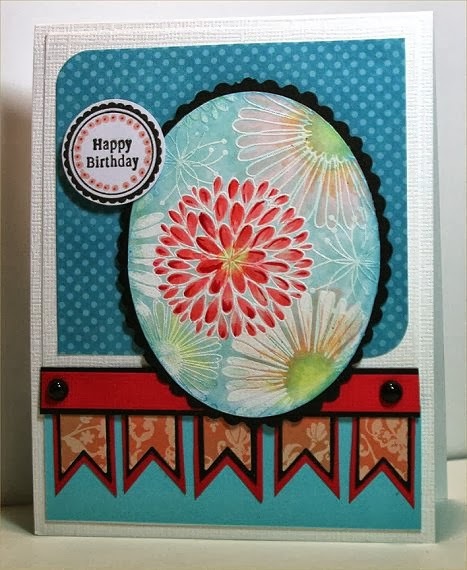 Love the emboss resist and the stamping you did!